The Saratoga County Municipal Center is located at 40 McMaster Street, Ballston Spa NY 12020; phone: 518-885-5388. Established in 1791, Saratoga County comprises an area of 812 square miles with an estimated population (ca. 2005) of approximately 215,000. 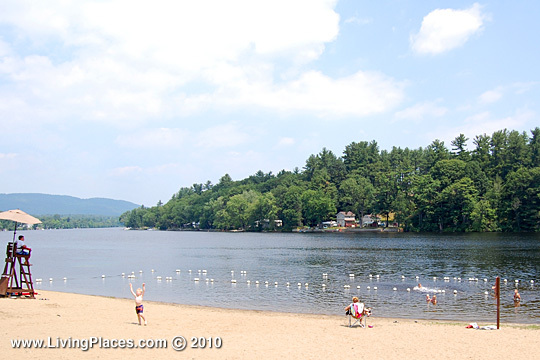 Photo: Saratoga County has it all; mountains, river, forest, and even a sandy beach, compliments of the Village of Corinth. Perhaps the only thing missing is some surf? Stay tuned. You never know what some new millennium, techno-visionary developer is dreaming up on her high-def, CAD-CAM workstation. Saratoga is bounded eastwardly by the Hudson, southwardly by the Mohawk and the county of Schenectady, westwardly by Montgomery and Hamilton, and northwardly by Warren and the Hudson. The Mohawk forms the division between Saratoga, Albany, and Schenectady, within four miles of the latter city. The Hudson divides Warren from Saratoga on the north, for about fourteen miles, exclusive of its windings. Saratoga is subdivided into nineteen towns. Its principal villages are Waterford, Stillwater, Schuylersville, Saratoga Springs, and Ballston Spa. It was made a county the seventh of February, 1791. Saratoga is divided into three tracts; the mountainous, the champaign and level. The first occupies the north-westerly part; the third, the south-easterly and easterly; while the second occupies residue. The soils differ very much. In the mountains, they are either light, or barren; in the champaigns, they are usually rich; and in the plains, both good and bad occur. MaCauley, James, The Natural, Statistical and Civil History of the State of New-York, Vol II., 1829, William Gould & Company (Gould & Banks), Albany New York.